As most businesses try to reign in spending during tough times, they try and do without. For some one-person offices, ‘doing without’ means getting rid of their offices altogether, according to Roger Kahn, owner of Intelligent Office of Garden City. Intelligent Office rents on-demand fully-furnished office space, and Kahn says he’s never been busier. Many of Kahn’s latest customers are independent attorneys who can no longer afford the $30-per-square-foot rent in Long Island Class A buildings and may have laid-off employees when they left. Located a few blocks from the Nassau County Courthouse, Intelligent Office is a business cooperative that charges from $150 to $250 a month for its space which includes shared receptionists, private meeting rooms, kitchenette, etc. and its ‘tenants’ can lease on a month-to-month basis. Kahn said his customers not only save on rent, but since Intelligent Office is fully-staffed five days a week, they save on salary as well. He said the portability of today’s technology also allows for a more flexible work environment. 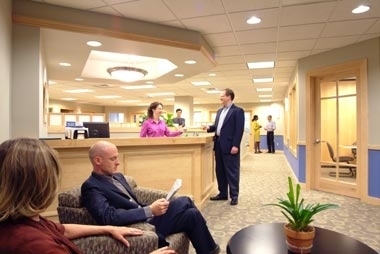 Packages at the Franklin Avenue office co-op can include local phone/fax number, conference room privileges, live receptionists and a secure mailbox with 24-hour access. David Winzelberg - who has written 804 posts on Spaced Out.